Fifteen-year-old Billy Ballard is the kid that everyone picks on, from the school bullies to the teachers. But things change drastically when Death tells Billy he must stand in as Pestilence, the White Rider of the Apocalypse. Now armed with a Bow that allows him to strike with disease from a distance, Billy lashes out at his tormentors…and accidentally causes an outbreak of meningitis. Horrified by his actions, Billy begs Death to take back the Bow. For that to happen, says Death, Billy must track down the real White Rider—who is lost in his memories. Stand alone or series: Book three in the Riders of the Apocalypse series. I reviewed the first two books in the series: Hunger and Rage. Why did I read this book: I’ve been following this series and enjoying it very much. I had to read Loss. The Riders of the Apocalypse is a high concept YA series and its books are a combination of an “issue” story with Fantasy. Each book in the series follows a protagonist as he or she becomes a Horseperson of the Apocalypse and each book explores a different topic. Book 1, Hunger dealt with anorexia as its protagonist became Famine whereas the second book Rage was dedicated to War, with a main character who was a cutter. I’ve enjoyed – with a few reservations – all books so far in the series and was looking forward to reading Loss. It follows 15 year-old Billy Ballard as he is tricked into standing in as Pestilence as its previous incarnation is lost in its own madness. Billy is the guy who everybody bullies at school and he has a hard time for it but when he gets Pestilence’s Bow and realises her has the power to bring down those who bully him he becomes scared. He is scared of his own power and of his own willingness to use it and so he asks Death to take it back. But this time around this horseperson was not picked by Death itself and Billy must confront Pestilence and convince him to take back his Bow and leave Billy alone. Billy then has to learn to stand-up for himself and find a way to bring Pestilence back. 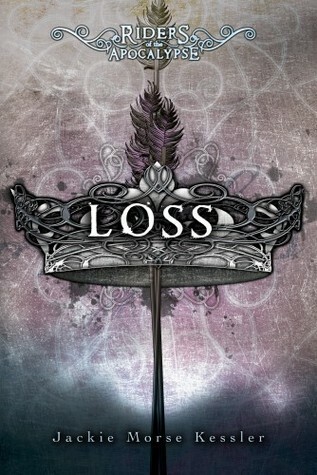 Loss is, as of now, my favourite book in the series. My main gripe with the series thus far had been on how the Fantasy elements had been underdeveloped but this time around there was a lot more of Fantasy, a lot more about the Horsepeople of the Apocalypse and how they are all about balance and what perform their duties (or don’t). I loved learning about Pestilence, his past, how he became the Conqueror. And I also absolutely loved how the author incorporated cool historical figures – King Midas, Robin Hood – in her mythology. More than that though, the plot itself was fabulous: how Billy had to travel in time inside Pestilence’s memories in order to find him and how that culminated to the point where he was picked at “random” (although not really because you know, TIME TRAVEL *wink wink*) into becoming Pestilence. One of the series’ biggest positives is how it addresses complex topics such as anorexia and self-harm with careful consideration. It is no different when it comes to bullying – it explores Billy’s emotional state very realistically in terms of how his daily life revolves in terms of avoiding the people that bully him, how terrible it is for kids to be harassed for no reason, how terrible it feels when people – including those who should be taking care of him, like his teachers – turn their backs and pretend not to see. Having said that, I wasn’t very enthusiastic about this story’s denouement. Unlike the previous books in the series in which the particular issue each book addressed had no easy solution or resolution, Billy’s bullying seems to be resolved far too easily with a very neat resolution that felt contrived and it didn’t fit the overall tone of the series. Another aspect that I was not keen about is how we know close to nothing about Billy’s romantic interest, his best friend. Billy spends the whole book dreaming about declaring his love for her, and about kissing her. When the kiss finally comes, I could only think of: what about her? Did SHE want to kiss him at all? I felt there was an assumption that she just wanted him as a boyfriend as well. Despite these reservations, I still think that Loss is the best book in the series so far. Its Fantasy elements are better developed and its storytelling tighter. In any case, it’s always a pleasure to read a Jackie Kessler novel. Bring on the last book Breath because I can’t wait to read about Death (it rhymed!). Notable Quotes/ Parts: When Billy first used his Bow. It was the wrong thing to do, but OMG so badass. Additional Thoughts: Check out Jackie Kessler’s guest post today on how D&D inspired her – plus a chance to win some goodies.